When considering a stoker model to set in front of your existing fireplace, look no further then a Leisure Line Hearth Stoker Stove. This unit is a mirror image of our Pioneer stove, but with the hopper and feeder mounted on the side for easy access. 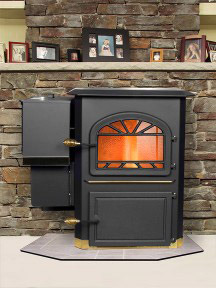 All the fine qualities of our stove are built into our Hearth Stoker. Digital Coal-trol thermostat and large ash pan are standard. The Hearth, like all Leisure Line Stoves is low maintenance and high BTU.